Acquired in several parts: purchase in 1987 (1987-06), donation by Horace Mather Lippincott (date unknown), transfers from the Division of Recreation and Intercollegiate Athletics. The records are organized in four series: By-laws and charter; minutes; committees, reports and correspondence; programs. The By-laws and charter and minutes series are arranged chronologically and the remaining series alphabetically by subject matter. The Athletic Association of the University of Pennsylvania was formed in the fall of 1873 by a group of University of Pennsylvania students to organize an athletic competition. In the years that followed the loosely organized student group planned several track and field competitions first among the student body and then, beginning in 1875, with local prep schools and colleges. The number of events the Athletic Association held and attendance at them grew steadily in the next ten years – reflecting the rise in sports in America at the same time. The growing demands of organizing events with the attendant costs for equipment and traveling as well as the need for sport facilities soon proved too daunting for the students handle on their own. A major change occurred in 1882 that led to the reorganization of the Athletic Association into a permanent legal corporation. In January 1882 the University doubled the size of its West Philadelphia campus with the acquisition of 13 acres from the City of Philadelphia. The Association knew immediately that this purchase would make it possible for students to have the dedicated space they desperately needed to hold competitions. In November a group of students from the Athletic Association meet with number of recent alumni to create a permanent organization to oversee sports at the University of Pennsylvania. 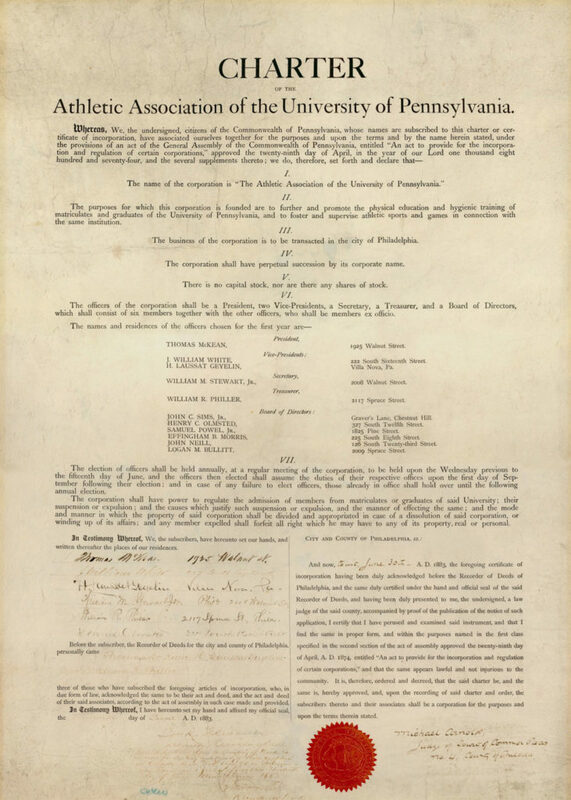 At its second meeting, a committee was formed to “select suitable ground for a gymnasium, running track, baseball and football ground” and entered into negotiations with the Trustees of the University of Pennsylvania in March 1883. At the same time a general meeting of the student body, the Association and the Provost of the University was held to discuss the plans for the reorganized Association and new athletic fields. By May the Athletic Association entered into a formal agreement with the University which allowed the Association to create a field and construct buildings on part of the 13 acres and formed an advisory committee of the Trustees to consult with the Association on matters concerning the management of the property. The agreement also gave formal recognition of athletics as part of the University’s educational program by establishing a Department of Physical Education, the head of which was to be selected by the Athletic Association and appointed by the University Trustees, and a source of funding in the form of a new student fee for physical education. The Athletic Association received its charter in June 1883 with the stated purpose “to further and promote the physical education and hygienic training of matriculates and graduates of the University of Pennsylvania and to foster and supervise athletic sports and games in connection with the same institution.” The control over sports shifted from the students to the alumni. The reorganized Athletic Association began the process of managing all the student athletic competitions. All sports fell under the control of the Association through its standing committees on track athletics, baseball, football, rowing, and cricket which were composed of the undergraduate and alumni members of the Association. The Association made the arrangements for intercollegiate games, hired staff to manage its fields, and collected ticket receipts. All revenue realized from the competitions was placed in a general fund which was used to subsidize the less popular sports. Though initially handled by the Association, matters concerning the selection and the eligibility of students were decided by the University Athletic Committee (formed in 1895) whose members were appointed by the Board of Deans of the University. The main achievement and Achilles heel of the Athletic Association was its building program. The first building project was the creation of the athletic fields at the corner of 37th and Spruce Streets. In March of 1883 the Association had raised $8,500 and the following year raised another $6,500. By May 1885 the new field which included a track, baseball diamond, football field and covered grandstands was opened for competition. These grounds were used until 1896 when the University chose to use the property for erection of the first dormitories on the West Philadelphia campus. New land was provided by the University at corner of 32nd and South Streets which the Association improved and built grandstands on. The new site was called Franklin Field. As the athletic program at the University grew, there was demand for larger and more permanent stands as well as a gymnasium. The Association took on the task of raising close to $600,000 for these buildings and acquired a forty-year lease from the Trustees of the University for the Franklin Field property in 1903. By the end of 1905 the Association had completed the construction of a more permanent Franklin Field Stadium, a new gymnasium (Weightman Hall), and a training house (James D. Dunning Coaches’ Center, formerly known as the J. William White Training House). The costs of these construction projects and lease obligations exerted a heavy toll on the financial resources of the Athletic Association, which operated under a deficit for most of its existence. Close to half of the money raised was through loans primarily in the form of mortgages. In order to generate enough income to cover the costs of its athletic programs and debts, the Association worked very hard to promote the football program. By 1904 football games were generating ticket sales of close to $90,000. In spite of its efforts the Association had trouble keeping up with loan obligations by 1916 which required the University to step in several times to pay the interest to prevent foreclosure on the buildings. The situation deteriorated to the point in 1917 that the Trustees decided to take over complete control of all athletic programs and events with the formation of the University Council on Athletics. Of the twelve seats on the Council, nine were filled with appointees by the Trustees and faculty of the University and the remaining three given to the undergraduate members of the Athletic Association. This event marked the end of the active role the Athletic Association played in sports at the University of Pennsylvania. Though the Athletic Association ceased to manage the athletic program in 1917, its loan obligations remained. The University Council paid the Association’s mortgage and bond debts. The final act came in 1922 when the University made plans for construction of a new Franklin Field with a seating capacity of 51,000. To finance the construction and pay off the previous mortgages, a $700,000 bond issue was secured by two mortgages in the name of the Athletic Association. As part of the financing agreement, the lender required that the lease to the Association be terminated and the “conduct and administration of competitive athletics” be explicitly stated as under the sole responsibility of the University Trustees. Though the new mortgages were in the name of the Athletic Association, the responsibility of paying the bonds fell to the University. These bonds were all paid off in 1931 when the University restructured all its debt obligations. The Athletic Association of the University of Pennsylvania Records document the establishment, organization and expansion of organized competitive athletics at the University of Pennsylvania from 1882 to 1917. The documentation is in the form minute books, committee reports, correspondence, and printed programs covering the period of 1877 to 1922. The minute books are complete from the date of incorporation in 1882 to 1897 and 1916 to 1922. They are supplemented the annual meeting minutes which cover the period from 1894 to 1907. The supporting documentation found in the Committees, Reports and Correspondence as well as the Programs series is incomplete. The minutes of the Association provide details on the management of the athletic grounds, the selection of team managers, the awarding of letters and numbers to student athletes, the finances of the Association. The committee reports and correspondence supplement this material with detailed information the operations of specific teams.